Vented Bulb Guards:Vented anodized aluminum bulb guards with finger tip adjustment ring. Highly Stable Base:Non-tip weighted base with baked enamel finish provides high stability for the fully adjustable lamp heads. Swivel, Flex Arms:Chrome flex arm and all-angle swivel provide an infinite choice of lamp head positions. 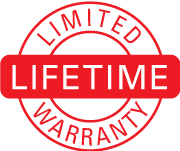 Solid State Power Supply:The solid state power supply used with all units and projector heads has a full range electronic intensity control for a precise adjustment of light levels and is calibrated to deliver the highest intensity consistent with long bulb life. Micro Quartz Halogen Bulbs:Narrow, combination, or wide beam patterns, integral reflector, 3,000 ft. candles at 6" (3,000°K), 5,000 hour average life, 1.5 in. diameter, double contact bayonet base - (per bulb). Optional Micro Heat Shield:This option, in conjunction with the integral dichroic bulb reflectors, reduces forward directed heat for sensitive applications. 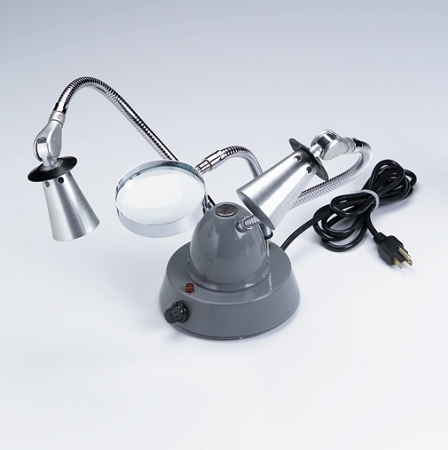 Optional Magnifier Attachment:Hands-free use of optional magnifier kit provided by built-in magnifier attachment socket on all lamps. Optional Accessory. The DynaLume® DynaLite illuminators utilize the most recent advances in "state of the art" illuminator technology. They are designed to produce electronically adjustable levels of brilliant white (3,000°K) light to suit the most demanding visual inspection tasks. The computer-designed, high efficiency tungsten quartz halogen (TQH) bulbs have integral multi-facet paralliptic reflectors, dichroic coating and universal beam pattern providing usable light levels exceeding 6,000 ft. candles per bulb. Average life at the highest intensity with the tungsten quartz halogen bulbs exceed 5,000 hours, resulting in outstanding operating economy on a per year basis.